This ocean front home has on ocean view and is only a 3 minute walk to the beach. 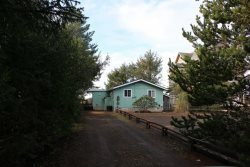 The Aqua Marine house is in Ocean City only 5 miles north of Ocean Shores. Inside enjoy our games, movies and books. Get cozy next to the fireplace or catch up on your sleep. Outside bask in the hot tub, grill on the BBQ, relax on the deck, play in the large fenced yard or walk to the beach. Park your car out of the weather in the two car garage or drive five minutes to the nearby casino, restaurants, shops and activities. All homes do require the first night plus tax for deposit. This deposit is non-refundable. If you cancel, this deposit IS NOT returned. There is a 2 night minimum stay, 3 nights during the holidays. All homes have a cleaning fee. You must be at least 25 yrs. old to rent one of our properties. 8 people max no large gatherings, receptions, weddings etc. No Smoking and dogs are welcome. There is a $25.00 per night per pet fee plus tax..
All staff was friendly and helpful. We enjoyed our stay very much! We had the space and privacy we needed to enjoy our vacation and we were able to visit town and play at the beach! We will be back! Thanks! The house is beautiful and extremely comfortable. The location is perfect. This is a great vacation home. We can't wait to stay there again. The house was beautiful and having that close access to the beach to drive down was perfect. IT was hard to leave at the end of our trip. We are seriously thinking of buying a place down in Ocean Shores we love it there so much. Been going here every summer for the last 22 years. Danielle was very responsive and friendly. Helped us check in a day early, it's a pleasure to work with her. We love this house. We used to live in Seattle and have been coming to Ocean Shores for 25 years. We've stayed almost everywhere there is to stay--but once we found the Aqua Marine that's our favorite. It's a 10-hour drive for us (from Boise), so we don't get there as often. Even when it's just the 2 of us we still make it a priority to stay at this house. Can't beat the location, or the view, or the amenities. Just as with our first visit, we found staff quick to respond to questions and very friendly. We enjoy working with this company. Perfect spot for our relaxation: big, safely fenced yard for dogs to play in while we enjoyed the big family-sized hot tub. Wonderful ocean/beach view and sounds from the main living area and deck. Comfy beds and roomy bathrooms. We love it and will be back! Best experience in over thirteen years of renting vacation homes in this area. We will be back. We are grateful to finally find a home to return to rather than beginning our search over each time we need to get away. We take long weekends once every quarter and so having a guaranteed good spot to land is awesome. Thank you! Every time it has been "GREAT"
Danielle and the other lady in the office were very friendly and helpful. Helped to make our vacation an outstanding experience. Very responsive to request for extra supplies. A pleasure to deal with. Stayed for 10 days in August. This was our 3rd or 4th stay at the Aqua Marine. Kids/grandkids joined us for part of our stay. View of the ocean can't be beat, close to small grocery store. Furniture is very comfortable which is important when you're staying for a week or more. Master bedroom and bathroom are large, shower is great. Appreciate the laundry soap and softener sheets. Even though it's only 2 of us (and our mini Aussie Harley), we wouldn't want to stay anywhere else. Great property.. Best part was the hot tub, washer and dryer!! Thank you for a great stay.